Massachusetts metallers ALL THAT REMAINS officially entered the studio on Saturday, July 12 to begin recording their new album. The as-yet-untitled follow-up to 2012's "A War You Cannot Win" is being helmed by producer Josh Wilbur, who has previously worked with LAMB OF GOD and GOJIRA. A late 2014/early 2015 release via Razor & Tie is expected. 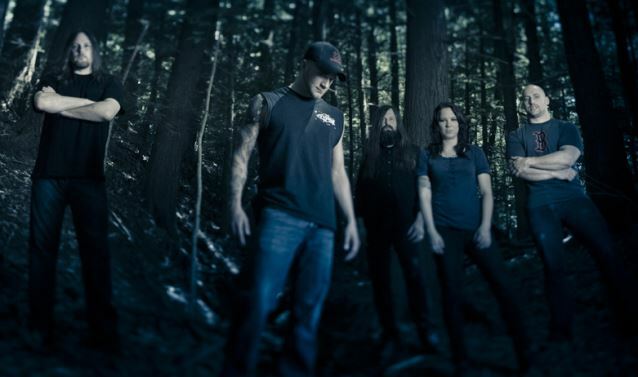 ALL THAT REMAINS singer Phil LaBonte told The Pulse Of Radio a while back how the band approaches a new record. "There's a lot of bands out there that are like, 'Oh, we went and we took a bunch of time and we were thinking about this and we were thinking about that,' and blah blah blah," he said. "ALL THAT REMAINS has never been that band. We've always been the band that's like, 'You know what? We've got to write a record, why don't we all just get together and come up with some ideas, and the stuff we like, we'll use, and the stuff we don't like, we'll throw away.' There's so many bands out there that are like, 'Oh, we want to change the world and we want to…' And it's like, 'Okay.'" ALL THAT REMAINS had a No. 2 single on the rock radio chart earlier this year with "What If I Was Nothing", which marked a stylistic departure for the band. The song's accompanying video was directed by Rasa Acharya and Dan Kennedy of Little Sky Film (SAY ANYTHING, WE CAME AS ROMANS). "A War You Cannot Win" debuted at Number 13 on the Billboard album chart and has sold over 115,000 copies to date.